Like everything else, disability is all too often viewed through a white cultural lens. That's something Vilissa Thompson is tirelessly trying to change. Last May, the hashtag #DisabilityTooWhite was trending among the disability community on Twitter. “#DisabilityTooWhite when you have to wait twice as long for a medical diagnosis or to receive adequate medical care b/c of medical racism,” read one tweet. “#DisabilityTooWhite when people still think “#autism is a white people thing” and black children go undiagnosed” went another. Vilissa Thompson, founder of Ramp Your Voice. Thompson, 31, has Osteogenesis Imperfecta (OI), a genetic disorder better known as brittle bone disease. 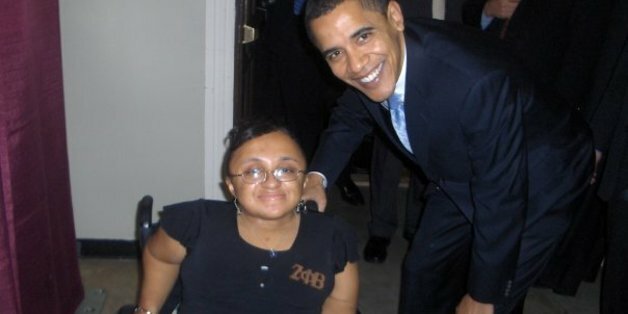 As a little woman of color who uses a wheelchair and hearing aids, she was frustrated by how rarely she saw images of people who looked like her in the media. With the hashtag #DisabilityTooWhite, Thompson helped foster a long overdue national conversation about how race intersects with disability. The ensuing tweetstorm was overwhelming. “I don’t think I’ve seen so many disabled POC speak so freely about themselves in my life,” Thompson told The Daily Dot in 2016. This response counted as progress in itself. With Ramp Your Voice, Thompson offers vital resources for some of the people most affected by various forms of institutionalized discrimination. In the four years since founding the organization, she’s created a strong community of support for Black disabled women and a unique platform for telling their stories. In her #BlackDisabledGirlMagic Series, Thompson publishes weekly interviews with the likes of Keah Brown, an entertainment journalist; Kathy Woods, a fashion designer for little women; and writer and activist Kerima Cevik. To help correct for the erasure of Black disability history in mainstream education, Thompson compiled the Black Disabled Woman Syllabus, featuring texts like Bell Hooks’ Ain’t I a Woman and Jennifer Barclay’s Mothering the “Useless”: Black Motherhood, Disability, and Slavery. We caught up with Thompson about the evolving conversation surrounding #DisabilityTooWhite; how to be a good ally of the disability community; and how she’s using her social work and advocacy efforts to resist an explicitly racist, sexist, and ableist political regime. Ramp Your Voice seeks to help disabled women of color cope with challenges posed by what you call their “triple jeopardy status.” What are some of the unique challenges that face disabled women of color in America? “Triple jeopardy status” refers to the combination of racism, sexism and ableism that disabled women of color endure. Racism—that’s pretty obvious, living in America, the way black disabled bodies have been treated as experiments, as disposable. Historically, black disabled people haven’t had autonomy, or been seen as human. In terms of sexism, we have the unique experience as black women of experiencing sexism with the element of anti-blackness thrown in. The term Misogynoir refers specifically to the sexism black women endure, which is different than that which white women endure, and different from what other women of color endure. Black women have often been stripped of our femininity and/or hypersexualized due to the history of being in this country. When it comes to ableism, black disabled bodies often endure medicalized racism. Disabled people experience heightened disparities when it comes to education and employment opportunities—disparities that are already heightened for people of color. The combination of all these -isms creates this unique experience where, when you encounter discrimination, you may not be able pinpoint exactly which -ism is at play. That’s why I talk about the triple jeopardy status of being a disabled woman of color. All of this affects how black disabled women see ourselves when it comes to reaching certain goals in terms of education, employment, and family planning. “Triple jeopardy status” helps us understand how these -isms and stereotypes can affect our self-worth and our understanding of beauty—not feeling beautiful, because we don’t see images of ourselves. These challenges affect pretty much every aspect of our beings. You wrote a moving piece about meeting President Obama as a college senior and the heartbreak you felt on the last day of his presidency. Since Trump’s inauguration, what have you been doing to cope? I’ve been continuing to do what I do —speaking engagements, interviews, writing about the effects of this administration, offering perspectives on how the community is responding from an intersectional lens and what kinds of challenges might arise for those who are of color and disabled, who are often receiving the worst end of healthcare. When the Trumpcare bill looked like it was going to be passed, I was quoted in articles about the bill and the administration’s cabinet members and their stances when it comes to disability. Also, practicing self-care and really promoting self-care among other advocates and activists. This work can be very draining, particularly when you’re surrounded by the chaos of reading about [the Trump administration] every day and wondering what’s gonna happen next. So I’ve been reminding people to practice self-care and to practice it myself. Unplugging from social media, taking a nap, watching sports—it’s baseball season, and I love The Atlanta Braves. You know, doing whatever allows me to unwind and really get centered. Hanging out with friends, checking in on people. Maybe having a glass of wine and reading a book. Just whatever relaxes me and allows me to recharge my batteries. Just being mindful of my energy and how I’m feeling. I believe if you’re not taking care of yourself, you’re not really good to anyone, much less yourself. It’s been about a year since you started the viral hashtag #DisabilityTooWhite. In that year, what progress have you seen in the effort to diversify the disability advocacy movement? The hashtag caused a lot of people to be more open about the erasure of black disability that permeates the conversation within the disability community. It allowed that conversation to surface and not just be the elephant in the room. It helped people understand how being multiply marginalized can affect someone’s ability to reach their goals; and to understand how identities such as gender and race can affect someone’s ability to feel accepted. The hashtag caused a lot of people to be more open about the erasure of black disability that permeates the conversation within the disability community. The media is a different monster—in terms of [representation of disabled people of color in] film and TV, that’s a bigger animal. But in terms of media as in social media, on an advocacy level, people of color have been speaking out more. That’s been the main effect I’ve seen. “I decided one day that I do matter, and the negative, hurtful ideals about who I am did not,” you write in a blog post about Ramp Your Voice. Regardless of their disability status, many people have a hard time finding this strong sense of self-worth. How did you make this attitudinal shift? Becoming an advocate, which exposed me to diverse experiences within a community, helped me to see that I did matter and my experience was valid and as important as anyone else’s. I like to call it “building a disabled village,” a support system of other disabled people —particularly those of color, women and/or women of color— to the point where I’m surrounded by individuals with similar experiences to my own, who can affirm some of the challenges I’ve experienced or witnessed and made me see that I’m not alone. It helps to fight back against the internalized ableism that the majority of people struggle through while living in this society that doesn’t really see us as whole and as human. Once I became an advocate and started to build that support system, it helped me move away from those negative ideals that might have impacted how I view myself and, instead, to see myself as whole. It happened gradually, it wasn’t something I’d planned. It’s a natural occurrence when you’re around people that look like you—you start to build more confidence and you don’t feel so isolated or alone. It’s a natural occurrence when you’re around people that look like you—you start to build more confidence and you don’t feel so isolated or alone. With the new administration threatening crucial legislation like the Individuals with Disabilities Education Act and the ADA, we need the efforts of Ramp Your Voice and similar organizations more than ever. What can people who are not already involved in disability advocacy or activism work do to educate themselves and align themselves with your movement? What’s a good entry point for allies who want to get involved but don’t know where to begin? For people who who are not disabled but who want to align themselves with the disabled community, it’s important to understand what good allyship is. It requires understanding your privileges; knowing that you don’t know what’s best for disabled people if you are not disabled. It requires understanding that disability has its own culture and history, understanding the different cultures that exist within this community and how they intersect; understanding the terms used. It requires taking time to learn about disability—not just diagnoses and types of disability, but also understanding how mandates work, like the Americans with Disabilities Act (ADA) and the Individuals with Disabilities Education Act (IDEA) and understanding how other acts have come into play. Understand the history of how the movement came about—what living with disability was like during earlier times, and what we are we fighting for now. Most people have a lot of inaccurate perceptions about disability that have to be unlearned. Most of this information is available for free. There are plenty of resources, like my Black Disabled Woman Syllabus, as well as grassroots organizations that have disabled people at the helm, who promote inclusion and visibility as well as intersectionality and diversity. Just take it upon yourself to become as educated as possible, and do some work on how you look at disability. It’s a learning experience—most people have a lot of inaccurate perceptions about disability that have to be unlearned. That can be uncomfortable process, but it’s necessary so you can be an effective ally. Can you highlight a few texts from your Black Disabled Woman syllabus that are particularly important and relevant reading at this moment in history, that you’d consider required reading for anyone interested in being an ally of the disability community? 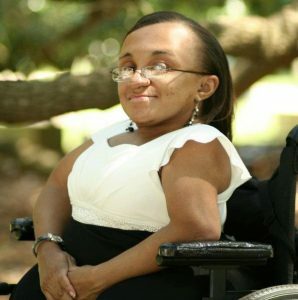 Kwanzaa Imani’s piece, “Black Women With Disabilities Need More Support Than Just Financial Aid,” tells about the complexities of triple jeopardy status in terms of receiving care and support. It offers a good understanding of what being multiple marginalized looks like. “Love, Disability, and Movies: My black disabled body is not the body reflected on screen,” a great piece by Keah Brown, talks about media representation. One of my favorite pieces, about a research study, called Mothering the “Useless:” Black Motherhood, Disability, and Slavery by Jennifer Barclay gives a very good and detailed understanding of what it was like to be a disabled slave.